Emily Gaskins remembers how hard it was to say goodbye to her dad, two sisters and toy poodle, Caesar. Gaskins, 12, moved with her mom from Coral Springs, Fla., to Cincinnati, Ohio, to train at Cincinnati Gymnastics Academy with Mary Lee Tracy. Gaskins says the move was tough but worth it. She still sees her family about once every month, but she still misses her dog. However, Gaskins says making sacrifices is just a part of her sport when she confesses she happily gave up going to public school. She wants to be an elite gymnast and join the national team to compete at the Olympics, so homeschooling was an understood choice. Although she dreams big, Gaskins understands she needs a backup plan. If joining the national team doesn’t work out, Gaskins wants to follow in her two older sisters’ footsteps and attend the University of Florida to compete on its gymnastics team. While most teenagers don’t even have a plan, let alone a backup plan, Gaskins exudes the attitude of someone much older as she talks about her desire to study anthropology and learn about how the world has changed. 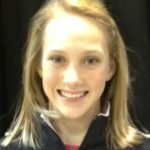 The 2013 Nastia Liukin Cup will be Gaskins first time competing in front of cameras, and she is thrilled to be able to experience it.